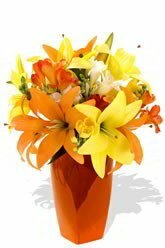 Send a piece of sunshine and brighten the day of that special someone with this vibrant bouquet of asiatic lilies and freesia's. 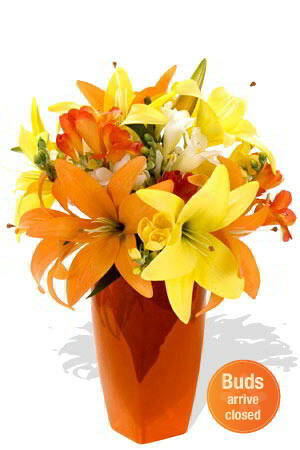 To ensure long life, the flowers may arrive with some closed buds which will soon open as fresh blooms and create a lasting impression.Lilies may be sent closed/partially closed in order to prevent damage and to last longer.The vase in the picture is not included, however if you would like to make your flower gift extra special, add a vase to your order. We have 3 vases to choose from; standard, premium, superior however for Sunshine we recommend the Premium Vase. Reasonably priced, very reliable service, and beautiful floral arrangement. I called up for a delivery same day and the consultant suggested I book through the website as it was 30% off. Flowers delivered without incident on the day as requested. Easy to order online. Delivery sent on time.